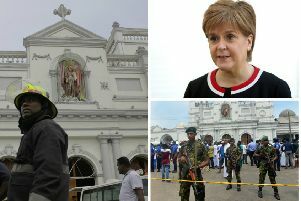 Nicola Sturgeon was accused of using Holyrood as a “conveyer belt” for Westminster austerity as the Scottish government’s budget came under fire at First Minister’s questions. Scottish Labour leader Kezia Dugdale made the claim as she said thousands of public sector jobs would be lost due to cuts in deputy first minister John Swinney’s budget. Ms Dugdale quoted figures from the Unite union that says they have lost 40,000 public sector jobs since 2010 and there will be a further 15,000 due to budget cuts. The Scottish Labour leader said that the First Minister had “bottled it with her austerity budget”. However, Ms Sturgeon hit back and accused Ms Dugdale of exaggeration about the scale of potential job losses. Ms Sturgeon said Scottish Labour was guilty of “wild scaremongering” in a “desperate” attempt to boost its vote in May’s Holyood election.